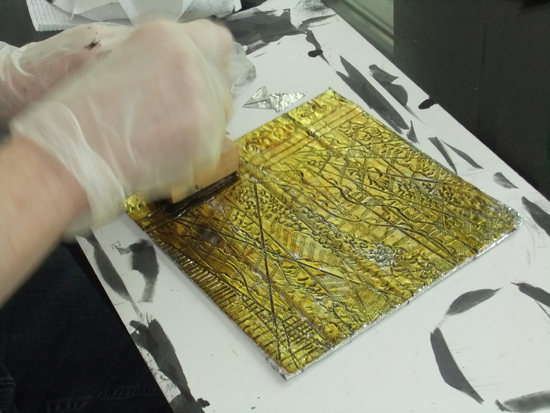 Just to remind you that it’s only a few days until the next “Open Studio” workshop! 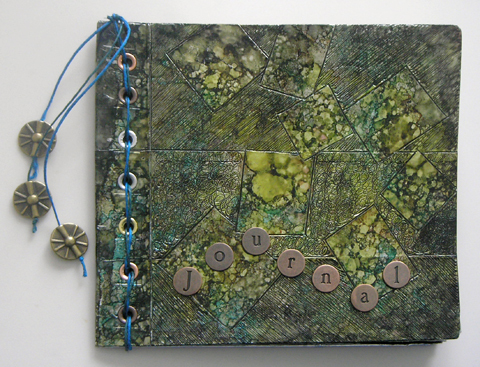 Celebrate Earth Day a few days late and come on by to create a journal using recycled materials! For details on the day click HERE! This is made with pretty basic, simple stuff that everyone has access to! 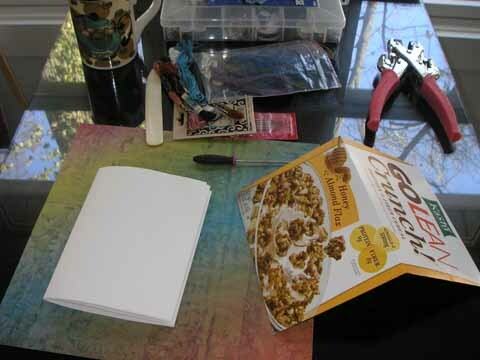 Several sheets of plain white paper for the pages (folded in 1/2 and trimmed to size), an empty cereal box for the cover (trimmed to size), and a piece of decorative paper. Although I used writing paper you could use blank sheets of copier paper, lined notebook paper or a variety of other types of paper to create your pages. 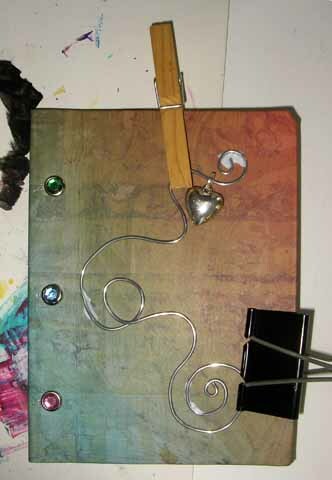 You could also create your own decorative cover with paint, markers, cloth, stamps, ink, crayons, tissue paper collage or almost any art medium you chose. Just be sure it’s thick enough that the cereal box design doesn’t show through – unless you want it to! 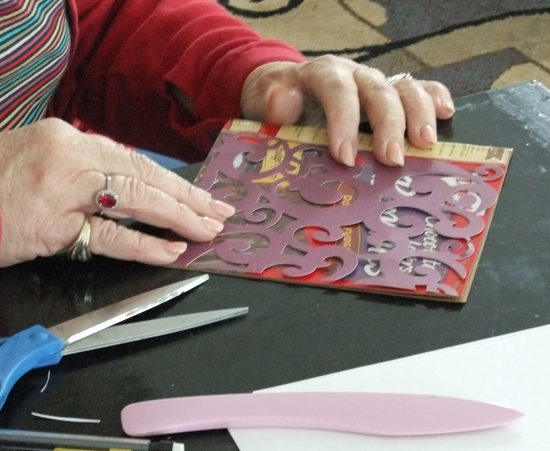 I used a bone folder to slide & press along the folds and make sure they were nice & flat but there are many household items that would work as well – the flat edge of a ruler, a butter knife – just get creative! The paper for the inside pages are trimmed about 1/4 inch smaller on all sides than the cereal box. Remember that you are folding them in half so they need to be twice the width! Cut your decorative paper slightly larger than the size of your cereal box. 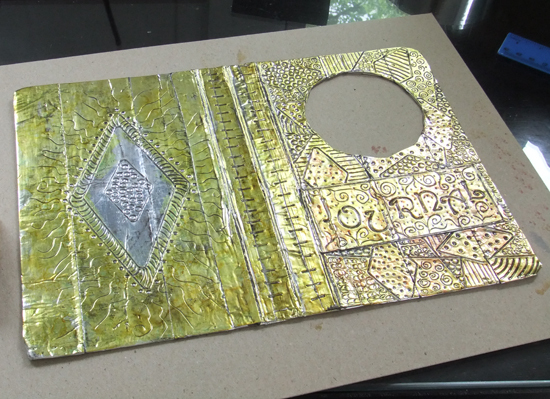 Spread a thin layer of PVA or clear acrylic gel (even rubber cement, white glue or modge-podge if that’s what you have) on the outside of the cover. 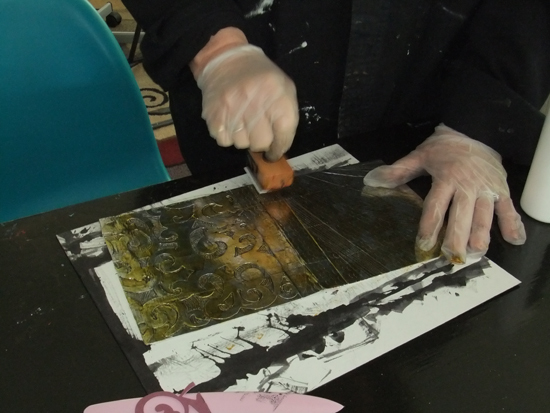 Center the decorative paper over the cover and smooth it from the center out to the edges. 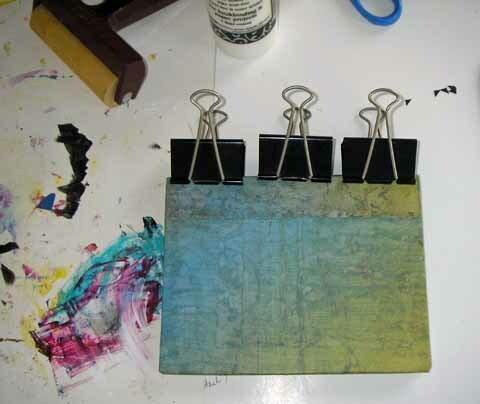 Turn it over, spread glue around the back edges then fold the excess paper over and secure it with clips. 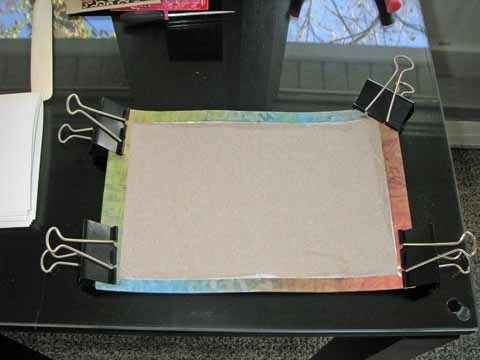 I used binder clips but clothespins or even paper clips will work just as well. 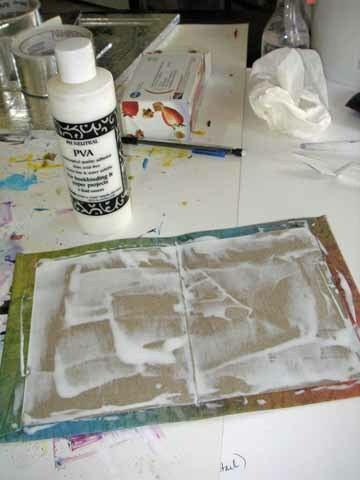 Wipe away any excess glue that squirts out the edges and then set it aside to dry for a few minutes. 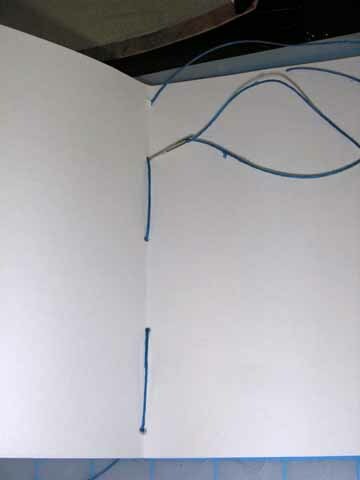 While the cover is drying you can create your “signature” (which is the fancy term for the bound-together pages inside your journal). Most signatures use about 10 pages, folded in half, for a 20 page journal. You can always use less, using more may make it difficult to work with, but not impossible. Once you have the pages folded and lined up neatly, take a ruler and measure to the center of you fold and mark this spot then add evenly spaced dots outward from them. 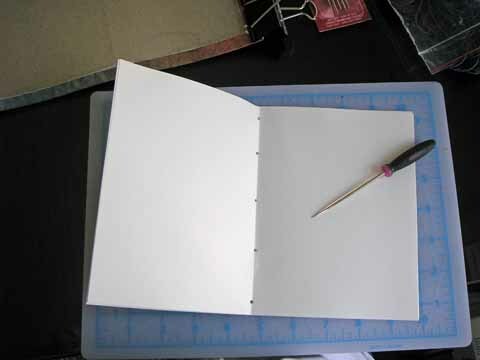 Use an awl (or other pointed tool) to make holes through all the pages where you placed the dots. 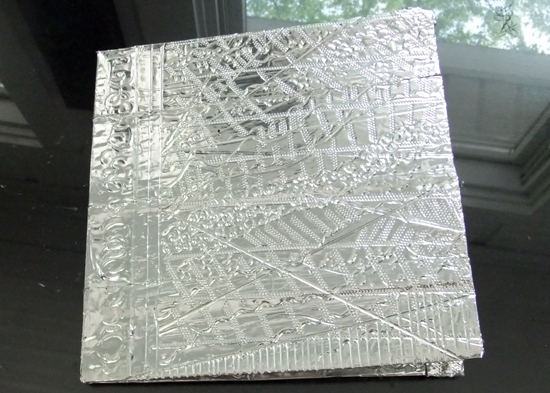 Once the outside of the cover has dried you’ll probably want to glue a cover on the inside for a more finished look. I used just a plain black sheet of construction paper to line my journal but, just like the outside cover, the sky’s the limit on how you will want to finish yours! Once the inside of the cover is dry then line up the signature inside the cover. Using a small hole punch (or an awl, etc.) 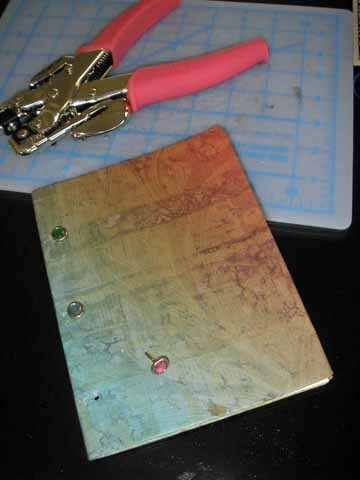 make holes through the entire journal. Insert decorative metal brads. 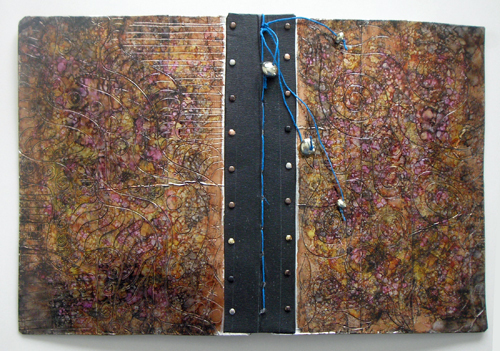 Now that they are in place you’ll probably want to cover the back of the journal where the brads are spread open. 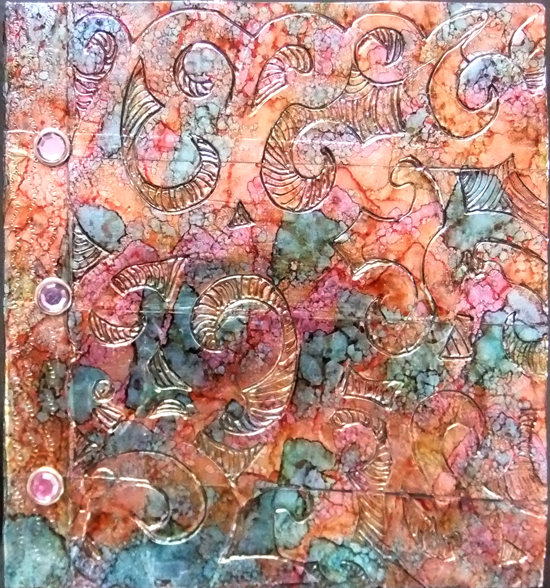 I used a strip of the same decorative paper on mine but you could get creative by using ribbon, tape or other items. Glue and clamp that down until it dries and you are almost finished! Although the pretty paper and sparkly brads were nice I felt like it needed just a little “something” more. 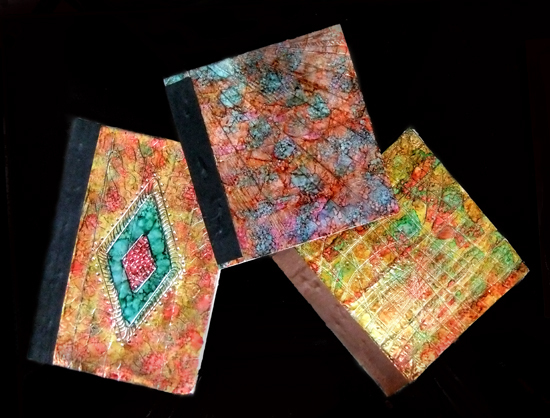 There are all kinds of options for embellishing your journals from whimsical to elegant. I have small boxes full of “treasures” that I collect but ultimately decided to use one of my favorite materials, metal wire. After bending and twisting it into shape I felt like it need one small focal point. 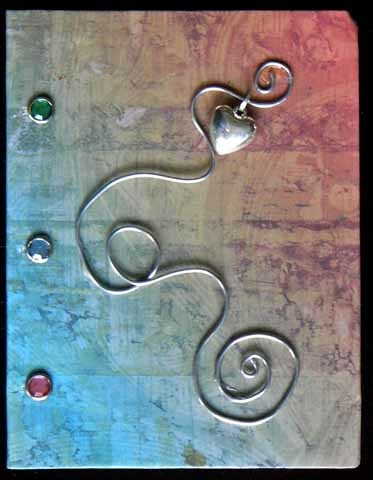 Back to the treasure boxes to discover the small silver heart. Perfect! 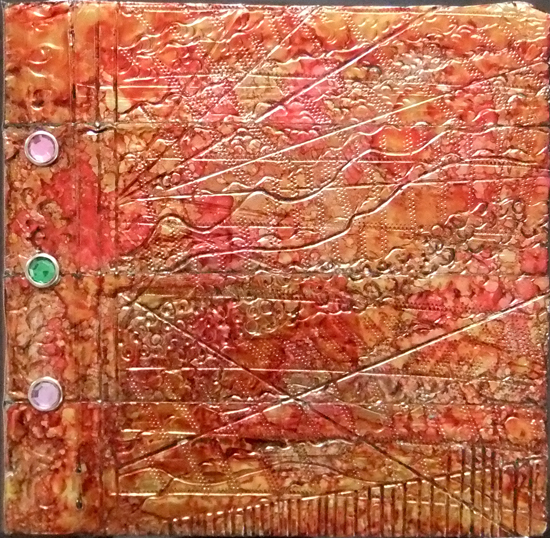 I attached the wire & heart with some clear acrylic gel and it was done. So, now that you know how, GO! Make Art! GO! Make Art! 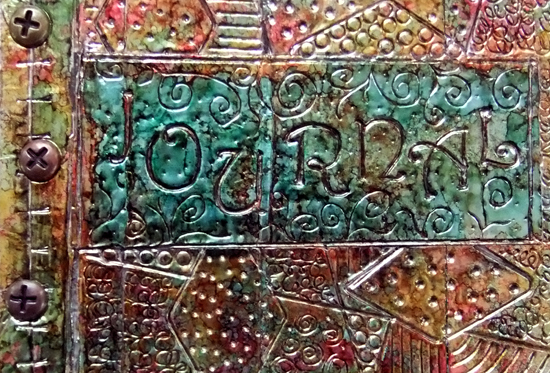 is a series of instructional posts to encourage EVERYONE to experience the joy of creativity. Look for more posts soon!